They told the parliamentarians who paid a visit to the Eechantivu Vidiyalayam Sunday that in the 1990 violence they lost their properties and other belongings but the authorities have not paid a single cent as compensation. They said nine houses had been burnt down in recent disturbances. However, except that nine families who have lost their dwellings others would be prepared to return to their places if adequate security is provided. They wanted assistance to rebuild their destroyed nine houses, they said. Mr.Sampanthan replied that he would take immediate steps to provide necessary assistance to procure building materials to reconstruct their houses. 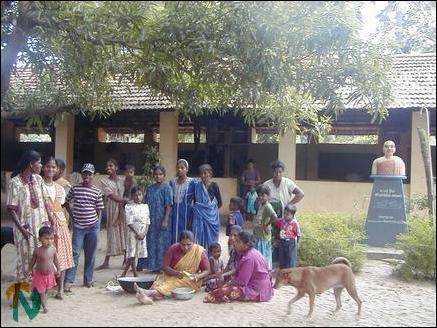 A section of Tamil refugees staying in Eechantivu school preparing meals in the school compound as the statue of Swami Vipulandnanda is seen in the background. 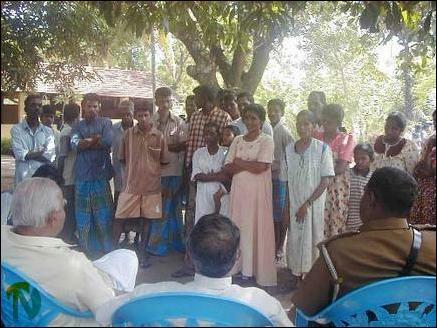 Both parliamentarians later addressed the Tamil refugees. Mr.Sampanthan said the Tamil speaking people in the northeast province should join hands to achieve their objective of setting up a self rule administration with adequate powers to look after their activities in their own lands. "The unity of Tamils and Muslims was sine qua non for the achievment of this objective. Without the support of Muslims no permanent peaceful solution could be found for the northeast conflict. The suffering would continue if both communities work at loggerheads," he said. Mr. Sampanthan further said, "According to official census conducted in 1981, Tamil speaking people had constituted about 75 percent in the eastern province. Of them 42 percent were Tamils, 32 per cent were Muslims and 25 percent Sinhalese. No official census was conducted after 1981. Hence Tamils and Muslims should join hands to save their traditional lands and villages in the northeast province. 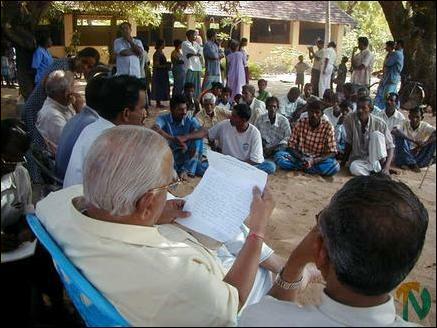 Parliamentarian Mr.Sampanthan seen going through the memorandum submitted by refugees. A section of refugees seated on the ground in Vipulananda vidiylayam are seen. "The Sinhala nationalist parties, Sihala Urumaya and Janatha Vimukthi Peramuna are bent on creating dissension between Tamils and Muslims to thwart the final attempt to find a lasting and permanent political solution to the ethnic conflict meeting the legitimate aspirations of minority communities. The main aim of the SU and JVP is to derail the peace process at any cost and to continue the majoritarian rule in the island. "Last week, SU leaders had come to Soorankal in Kinniya division and supplied provision to Muslims and said that President Ms. Chandrika Kumaratunge, Prime Minister Mr.Ranil Wickremasinghe and Minister Rauff Hakeem would not come to their rescue except them. "Are we going to help these Sinhala nationalist forces to achieve their chauvinistic ends by fighting each other? "Tamils and Muslims have been living side-by-side in villages such as Nilaveli and Kuchchaveli in the north of the Trincomalee district and likewise in the south for several hundred years as brothers and sisters. A cordial atmosphere between Tamils and Muslims prevails in Batticaloa and Amparai districts due to continuous dialogue between the LTTE and the Muslim civil leaders. The same procedure should be followed in Trincomalee district too to promote better understanding between the two communities." 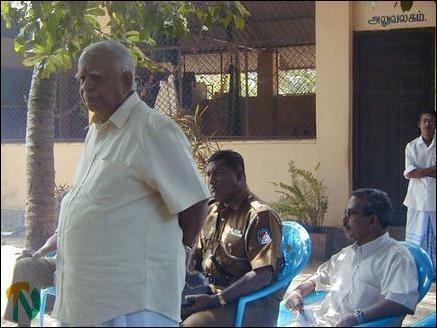 Messrs Sampanthan and Thurairatnasingham later met with Muslim families in Faizal Nagar, which is located very close to the Kadaloor hamlet, which has been abandoned by Tamils due to last week's disturbances. The Muslim families told the parliamentarians that both communities have to live side by side as they have been from the same village and have no other places to go, and that the people should develop better and healthy understanding. Mr.Sampanthan and Mr.Thurairetasingham assured their wholehearted co-operation for them to ensure harmony between the two communities in the future.